We receive valuable input on a daily basis that helps us make continuous improvements to the GET Program. Some of the most valuable feedback we receive is that of our account holders – the individuals and families who trust us to help them prepare their children for the future. We hold their opinions, positive or constructive, in extremely high regard. For this reason, the highest compliment we can receive from them is a referral to a friend. With this great gift in mind, we would like to reward account holders that refer a friend between now and Friday, May 23rd, by entering them into a drawing with a chance to win an iPad Mini! Using the Tell a Friend feature on our secure website, you can send a message to a friend that you believe may benefit from the program. 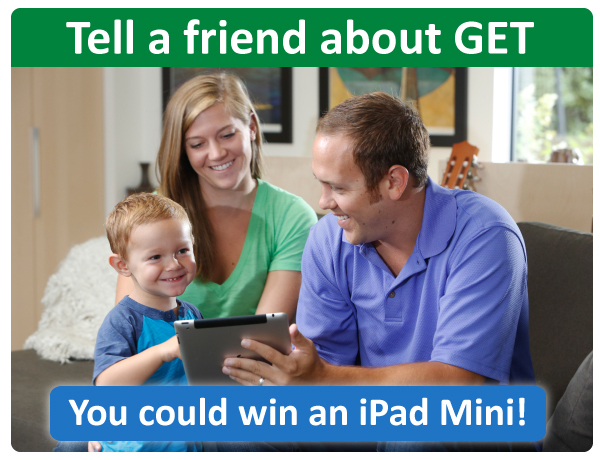 We will follow up with a short message with information about GET, and your name will be entered in the weekly drawing for an iPad. The friend or family member that you refer will also be entered in a separate drawing to win an enrollment fee waiver (valued at $50) for the program. Drawings will be held once a week during the promotion for a total of four drawings (one entry per person, per week). Our GET families have often been gracious enough to pass on their thoughts on the program. The Hayes Family of Bellingham writes, “We value GET for the opportunity to invest in a fund that secures college for our children. Knowing that our children will have access to higher education, gives us a great sense of security and peace of mind.” The Schofield-Isensee Family of Ferndale adds, “It is a relief to have our son’s college savings with GET. We don’t yet know his future, but we are grateful that our choice to save with GET will enable him to have more choices later.” Kind words from families offer a great insight into the things that our account holders find to be most valuable about the program. The confidence of our account holder’s is invaluable to us. Over the 16 years since GET began, word of mouth has been a powerful method of spreading awareness of the program. For all of you that have contributed to this, we’d like to say thank you! By sharing your stories, insights, and successes, you are helping other families plan ahead for an important expense and providing them with tools to make an informed decision.